Hubby and I have never agreed on the beauty of trees lining the streets, shading the house, or decorating the yard. All he sees are the leaves that collect everywhere in the fall and the mess they make. Whereas I see is the lush foliage and cool shade in the summer, the beautiful changing colors in the fall, the sanctuary for birds and squirrels in the winter, and the promise of new life in the spring. Unfortunately, my arguments for having trees has pretty much been ignored and our property is treeless, except for the one tree Hubby wanted — our Plum Tree. The only tree he actually agreed to letting me have was some sort of prune plum variety because it was a fruit that he loved. He actually likes to eat these plums when they are still green and nearly bitter, but he does enjoy all the canning I do with the fruit once it is ripe as long as I maintain a certain tartness in the end products. 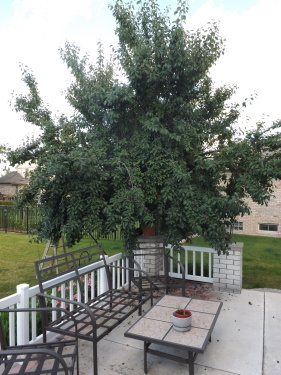 When Hubby agreed to the plum tree some 15 or so years back, I had no idea how much work one little tree could be. 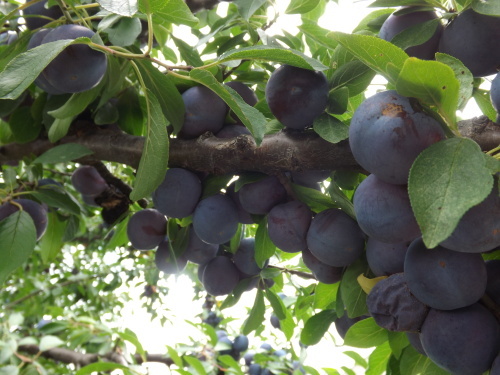 In fact, I just recently read in two of my gardening books that plum trees are really not recommended for amateur gardeners because of how labor intensive they are. I can certainly attest to this. The first few years we had out tree we had just a few flowers in spring and a few plums. Actually it turned out to be just enough for Hubby to enjoy eating right off the tree. After these first few seasons of just enough to eat, we enjoyed one season with quite a few plums – enough to can jam and preserves. Then for some reason our tree stopped producing. For at least five years our tree didn’t flower at all. It was lush with leaves come summer, but in the spring there was nothing. After some research on the internet and examining our tree closely, we discovered that our tree had brown rot. 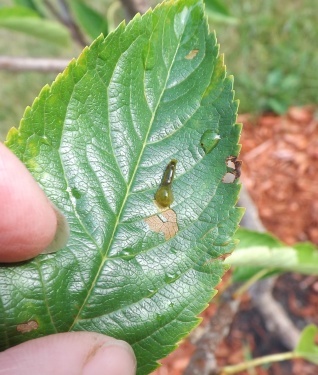 This is a fungus that forms on the branches and trunk of the tree when rotten plums are not removed from the branches or picked up after they’ve fallen to the ground. Apparently the rotten fruit pretty much poisons the tree and stops it from producing fruit. See that clump of brown sitting on the V portion between the trunk and the branch? That’s brown rot. 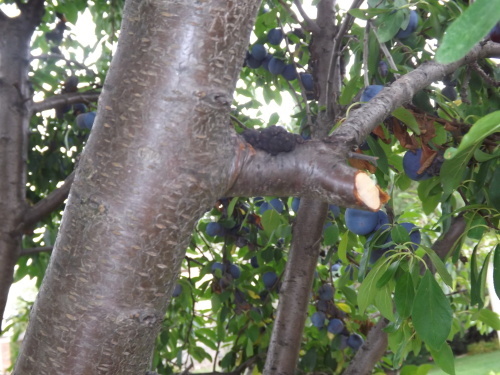 Once we figured out why our tree no longer produced fruit, we wanted to know how to fix it. Many experts immediately suggested cutting down the tree and replanting in a different location. This was not an option. It had taken me years to get Hubby to even agree to a tree, there was no way I would get him to cut this one down, remove the stump, and then plant another tree. There had to be a better way. 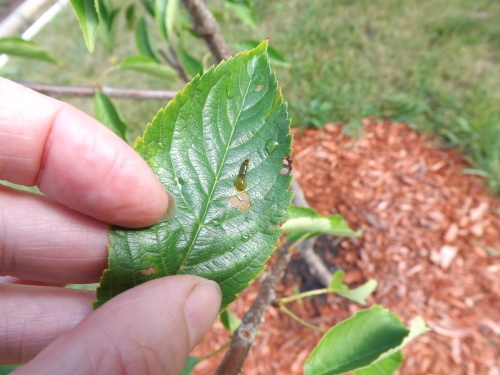 Researching further we discovered that there was a spray we could apply to our tree beginning in the spring and continuing throughout the blossom and early fruit stages into early summer. Deciding this was our best and basically only option, we decided to try this. 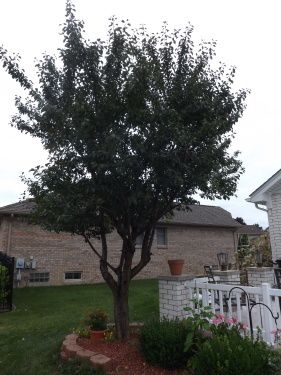 The first step was to remove as many of the branches that were infected as possible in the fall. After we pruned all the branches with brown rot, we were left with a stump and one or two branches. 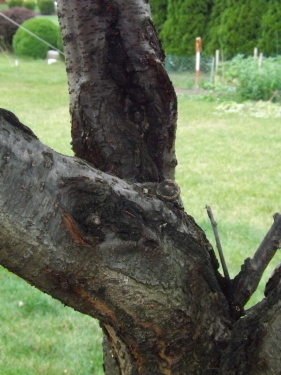 The trunk was infected as well, so we cut as much of the brown rot off that. Then we applied several applications of the spray we were to use in the spring to what was left and kept our fingers crossed. The following spring when the first signs of life began to show on our little stump Hubby began the treatments. Every week he sprayed the tree, careful to hit every inch of the trunk and branches. To our surprise, we actually had a few blossoms. Once the blossoms began to bloom, Hubby cut back to spraying the tree every 14 days. 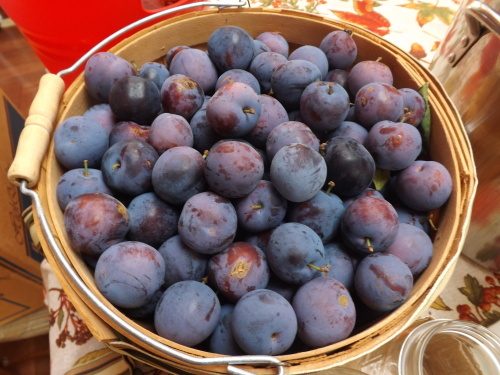 By early summer we had a handful or so of small plums. That first year was certainly not a bumper crop, but we persisted and after several years our little stump, or rather tree, really began to flourish. 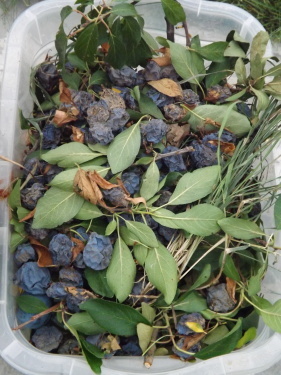 The trick was to make sure that all the fruit was picked from the tree at the end of the season and none of the rotten fruit was allowed to stay on the ground for any length of time. This also helped eliminate all the tiny bees that would infest the grass in search of the fermenting fruit. 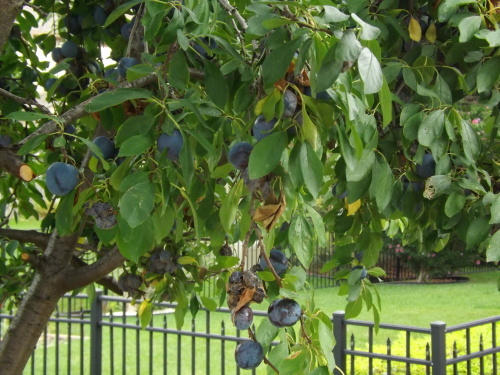 For the past three years we have picked over 300 pounds of fruit each year from our little plum tree. That isn’t usable fruit, but total fruit. I’d say about 1/3 of the fruit we harvest is usable. The remaining is rotten, spoiling, or dehydrated. This could be eliminated if we were to thin the fruit when it begins to form, but with the tree producing as it has, this is not a viable option. Instead we just have to be diligent in removing all the rotten fruit from the branches and the ground — not an easy task. Our plum tree weighed down with fruit prior to any picking. Today I finally finished picking all the fruit, rotten or otherwise, from our plum tree. We ended up picking 153 pounds of usable fruit and had at least 6 five gallon buckets of rotten, spoiling, or dried up fruit. 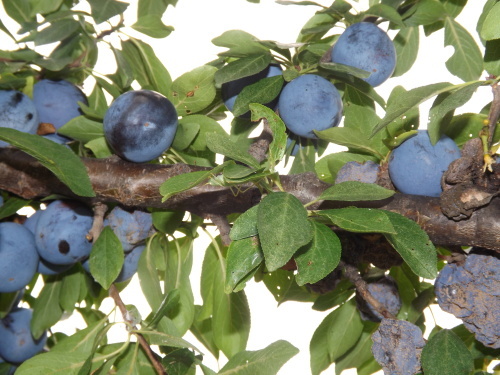 The tree has been pruned back considerably, because after three years of bumper crops I think both the tree and myself need a break from so many plums. but by cutting off infected branches, removing every plum, pit, and rotting fruit, and maintaining a regiment of spraying the entire tree during the spring and early summer and then again in the fall after we have finished harvesting, our tree survives, and for this I am — Simply Grateful. 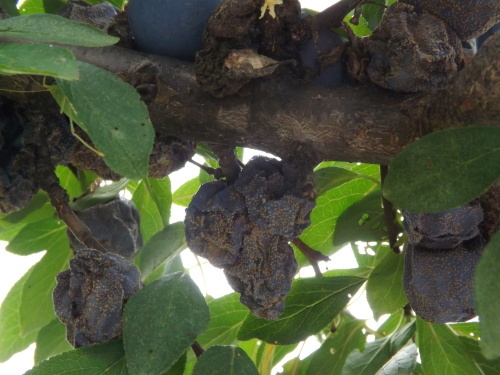 Categories: Disease, Plum Tree, Plums | Tags: Brown Rot, Plum Trees | Permalink.